It is with deep sadness that we have to announce the untimely death of Danny Gilbert, Danny was one of the founding organisers of the Craftmanship Competition®, Danny won the Junior Craftsman of the year at Scarborough in 1953, in the year of the Queens Coronation year, at the tender age of 15. Billingsgate market has scheduled a number of fish-based courses for chefs and fishmongers. First up is the Level 2 Knife skills training with Gary Hooper, president NFF, on 28th March. This course is designed for chefs or those with cutting experience. It is an opportunity to work with a wide variety of species under the watchful eye of an experienced blockman. The species used on the day will vary with the seasons, but will include various methods of filleting, boning and pocketing of fish. Portioning fillets is also included. This is followed by C&G Seafood Retail Certificate, on 7 & 8 May – an intense course with plenty of fish preparation on day one with quality assessment lectures. On day two there will be a market visit and further lectures. The majority of the rest of the day is spent in the kitchen with our chefs who will inspire and demonstrate a range of cooking methods and discuss the health benefits of eating fish and shellfish. There is also a ‘Get into Fishmongering’ course with Charlie Caisey on 4 June, which aims to offer a practical and motivational introduction into the basics of fishmongering. There will be hands on experience preparing fish, together with an introduction to Billingsgate Market. We will also offer direct contacts with our network of companies that regularly employ staff. Places on the course will be strictly limited. The day starts at 6.30am with a market tour. After breakfast you will spend the morning working on knife skills. After an informal lunch (eating some of the morning's fish) there is time to discuss individual projects in a workshop environment. Meanwhile the ‘Intro to Fishmongering’ takes place on April 17. This day includes a Market visit and both classroom and knife skills room based sessions. To accompany the course a training manual is provided including: General Guide, An Overview of the Seafood Industry, Quality Assessment, Care of Product, Hygiene and Food Safety, Care of Tools, Knife Skills, Cleaning, Display, Customer Service, Answers to Exercises, Further Training. Our latest news update will soon be on it's way to all NFF members, with a sneak preview of what's in the current issue below; loads of industry news along with plenty of current information and advice - its a susbcription not to be missed by anyone in the fishmongers trade! European Union fisheries ministers have agreed to phase out the controversial practice of dumping unwanted fish. After a tense all-night meeting, ministers said a ban on "discards" should be phased in, starting in January 2014 for certain types of fish. Ministers agreed some exemptions to the ban - but the European Parliament may still refuse to accept them. It is a victory for campaigners who have demanded the end of a practice that has brought the EU into disrepute. The UN says Europe has the world's worst record of throwing away fish. Almost a quarter of all catches go back overboard dead because they are not the fish the crews intended to catch. The decision reached early on Wednesday morning was driven by northern European nations, including the UK. They prevailed over mainly Mediterranean countries, which were fighting to protect the interests of their fishermen. The ban will apply to pelagic stocks like herring and whiting from next year, and to white fish stocks from January 2016. Spain, France and Portugal managed to cling on to some restricted exemptions, particularly relating to crews operating far from land in mixed fisheries where the cost of landing unwanted fish is deemed to be prohibitive. These crews will be allowed to discard 9%, shrinking to 7%. This figure is too high for the northern nations and the European Commission, which say the public expects that in a hungry world no fish should be thrown away. Details of how exactly the discards ban will work in practice with the quota system or its projected replacement will be debated later. The British government, one of the campaigners for change, said it was disappointed that the ban was not absolute, but that last night’s result was an historic victory to end a "scandalous" policy. It is one instance in which mass public pressure has clearly influenced the politicians, with almost a million people on the Online campaign site Avaaz demanding an end to discards. UK Fisheries Minister Richard Benyon said: “This is a historic moment in reforming the broken Common Fisheries Policy. The scandal of discards has gone on for too long. The deal builds on a recent commitment to fish sustainably, and to allow more regional decision making. Many crucial details are still to be resolved over exactly what sustainably means, how the policy is enforced, how fishing crews are supported and how they are helped to buy gear that fishes more selectively. Seafish have responded to the Fish Fight charter, with their views on protecting the marine environment - the full respose can be viewed by clicking here. Fish Fight chef's dive caught scallop drive is 'grave mistake - by Tom Seaman, taken from Undercurrent News. Scallop dredging is set to be a focal point of the upcoming Fish Fight program, with Hugh Fearnley-Whittingstall advocating for dive-caught scallops. Mark Greet, chairman of the UK scallop association, said this is the wrong focus. “A number of high-profile chefs continue to urge consumers to seek out diver-caught rather than dredge-caught scallops because of the alleged destruction inflicted on the seabed by the latter,” Greet told Undercurrent News, in relation to an article published in the Daily Mail by the chef. “This is a grave mistake on their part because unlike traditional scallop fishing, scallop diving is unregulated with participants often taking shellfish from areas rich in marine life where no scalloping boat would be allowed to fish,” he said. The lack of management also means there is very little bio-toxin testing conducted on dive-caught scallops, which brings an element of risk to the sector, said Greet, who is also managing director of processor Falfish. The Scallop Association would “be only too glad” to discuss all scallop fishing practices with any chef, retailer or consumer that has concerns about the industry, said Greet. The UK’s scallop fleet “adheres to unparalleled sustainability measures to ensure consumers can eat British scallops with a clear conscience”, he said. These scallop beds are actually more affected by the tides and the motion of the sea than the boats fishing them. “The Scallop Association believes it speaks volumes that a lot of the changes that have been made in the scallop sector and the on-going equipment trials are voluntary, fishermen-led initiatives. “Despite the tough economic climate, fishermen are putting their hands in their pockets because they believe it’s the right thing to do. Under no circumstances should they be vilified for their bold actions,” he said. Mr Jonathan Adams of E Ashton Fishmongers in Cardiff has been elected unianimously as 47th President of The National Federation of Fishmongers. Mr Adams marks a historical first by following in his father's footsteps, Mr John Adams - NFF President from 1976-1978. The Federation committee would like to congratulate him and wish him success throughout his term. Mr Andrew Kenny was elected as new Vice President. Mr Adams was interviewed by ITV News on 8th February following his election as president - the interview can be seen here.. The National Federation of Fishmongers would like to thank outgoing President Mr Gary Hooper for his hard work and effort on behalf of the NFF and Fish industry throughout the last three years. Following the announcement that mackerel has been taken off the list of sustainable fish by the Marine Conservation Society following a failure to agree international quotas, Scotland's Fisheries Secretary Richard Lochhead has said he is 'perplexed' by the decision. "I am perplexed by the Marine Conservation Society's claims as they are rather premature given that mackerel is a stock that is being fished sustainably by the Scottish industry in line with the latest science. "Just last week the EU and Norway have agreed to take a 15 per cent cut in their mackerel catches, in line with the scientific advice, to safeguard the future of mackerel stocks. This reduction was necessary because of irresponsible behaviour by Iceland and Faroes who are fishing ten times the amount of mackerel in recent years - which is clearly unsustainable. Whilst the stock is currently at sustainable levels, it will, in time, become unsustainable due to those countries overfishing. "I hope the market will differentiate between mackerel caught by responsible Scottish vessels and that caught by irresponsible fleets who over fish the stock. 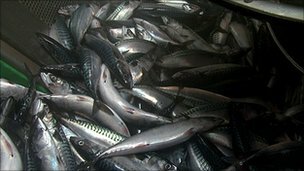 "Indeed, all the main retailers that we have spoken to are continuing to stock Scottish Mackerel and I hope they will continue to do so given our fishermen's ongoing commitment to fish mackerel in a responsible and sustainable manner, as shown by the reduction in catches they are taking this year. It's time for us all to get behind our fishing industry and support them at a time when the irresponsible actions of other country's fishermen poses a real threat to their livelihoods. "Negotiations on this issue are still ongoing and I would like Iceland and Faroes to come back to the table but with sensible proposals this time." The President was invited to attend the Christmas Carol Service by Candlelight at the historic St Mary at Hill in Billingsgate Parish on Tuesay 11th September, the guests included the Master of the Billingsgate Ward Club and also the Master of The Worshipful Company of Water Conservators! The President conducted a reading from The Gospel of Luke, Chapter 2 verses 1-7. The service was followed by Mulled Wine and Mince Pies, the Federation has nutured a relationship with the church over recent years through the support of the Harvest Festival Service, supported by Charlie Caisey MBE, for many years and also more recently the Christmas Carol Services, which the current President has supported throughout his three year term! This has culminated in an invite for the President to join the Billingsgate Ward Club, to represent fish mongers in this historical London ward which has been linked to seafood for over 900 years! The National Federation of Fishmongers President, Gary Hooper said " It was a real honour being invited back to St Mary at Hill to conduct a reading for the third time, I really enjoy the occasion and would like to thank Reverend Canon Flora Winfield and Linda Foster, Parish Administor for the invite and opportunity to give a reading, I look forward to supporting the church in the future"